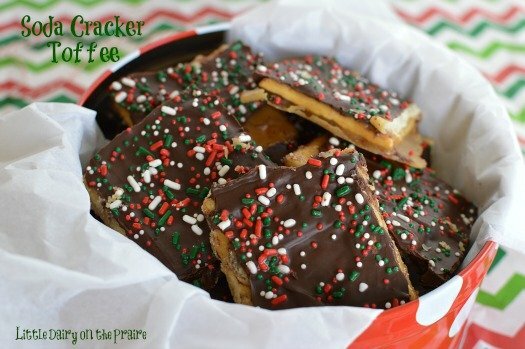 20 Minute Christmas Crack is my #1, all time favorite, easiest ever to make candy! I love this stuff! I cannot be left alone with this candy! I’m a sweet and salty addict and a chocolate addict. 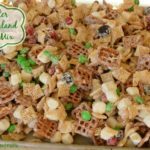 A couple of the best things about this candy are, that it always turns out, and that the kids can easily help make it! 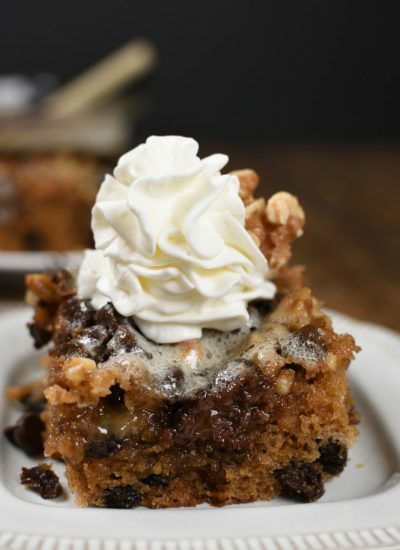 If you are scrambling for that last minute neighbors and friends gift, a crowd pleasing dessert or something for your own family…this is it. The fact that it only takes about 20 minutes from start to finish makes it extremely holiday friendly. Besides that, look how cute it is. I have dolled this candy up for about every holiday on the calendar and it’s a hit every time. 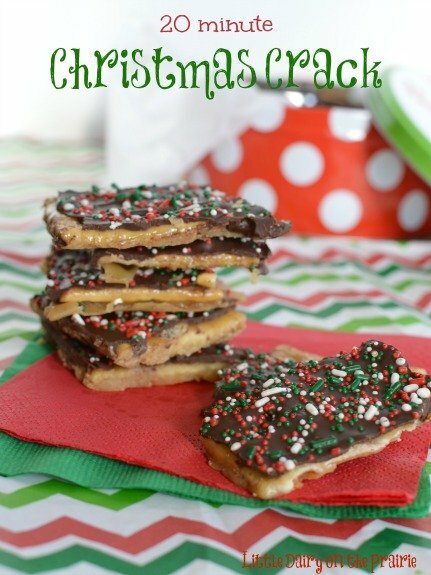 So save some time for yourself, skip the sugar cookies and make this candy! See, a pretty little gift. Preheat oven to 400 degrees. Line baking sheet with aluminum foil and spray with cooking spray. Line foil with saltine crackers touching, salt side up. Over medium heat melt butter and brown sugar. Stir it constantly until it begins to boil. As soon as it is gently boiling, quit stirring and turn the heat down just a little. You want the heat high enough to just keep it boiling. Boil it for exactly 3 minutes after you quit stirring. As soon as sugar and butter have boiled for 3 minutes pour evenly over saltine crackers. Spread with the back of a spoon if necessary. Bake for 5 minutes. Immediately after removing from the over sprinkle chocolate chips over the crackers. Let them sit for a minute then spread with the back of a spoon. If you want to doll them up for the season, sprinkle with Christmas perils. Or chopped almonds or walnuts. Or drizzle with colored dipping chocolates. Let them cool and break them in pieces. Simply put them in a cute little tin, and just like that you are done! Except sharing the recipe after everyone requests it!! HeHe!! This looks yummy! I can spare 20 minutes to make this. Can’t wait to try it. Haha! It’s totally worth the 20 minutes it takes to make it! Well, I made this yesterday and have already made it again today! These treats really are as good as you said! I want to thank you again for sharing this easy recipe. I had bounding time with my daughter. Great part is she could really help out and already told me my next steps by the second time making these. We made cute bags and gave them as gifts. Yay! Spending time in the kitchen with the kids is the best! Glad they turned out so well for you! Merry Christmas! This recipe looks simple enough. I’m not a novice baker but perhaps you could share the brand of chocolate chips used? Mine certainly seized the first time as I followed your directions to a T. The second time, they semi-melted. Still not spreadable. Would love to share this but not as written. Thanks! I use a variety of brands. Most often I use Nestle chocolate chips. I sprinkle them on pretty soon after the candy gets out of the oven. Let it sit until the chocoalte chips are spreadable and then spread them with the back of a spoon. I haven’t ever had a problem with the chocolate seizing. I want this method to work for you becasue you don’t have to get another pan dirty. But, if it doesn’t work you could always melt chocoalte in the microwave and spread it on the candy once it has cooled. Let me know if you need more help! Good morning! Every time i make this (and i follow the directions for the time on how long to boil ) the “toffee” is still grainy. What am i doing wrong? I’ve had it before and its so good and easy and super cute, but i get so frustrated!!! HELP!!! I know how frustrating things like this can be. I have the best luck when I gently bring the butter and brown sugar to a boil. I don’t cook it over medium heat and I whisk from the moment I start cooking it until the moment it starts to boil. Also, water can change the texture of the “toffee” so you want to make sure your pan and utensils are dry before adding ingredients to them. Hopefully that help. And yes, they are worth perfecting because once you get the hang of it they are quick and easy to make and oh so yummy! Let me know if those tips don’t help and we can get together! You’ve gotta have this recipe in your aresenal! Hmmm…There are a few things that are a tiny bit tricky about this recipe. I like to slowly bring the butter and sugar to a boil or else the two ingredients can seperate which isn’t good. It’s also to be exact on your cooking times. Maybe next time they will be perfect! And yes, they are tasty no matter what! I always use salted butter because I’m a bit of a salt lover! You can use either though! 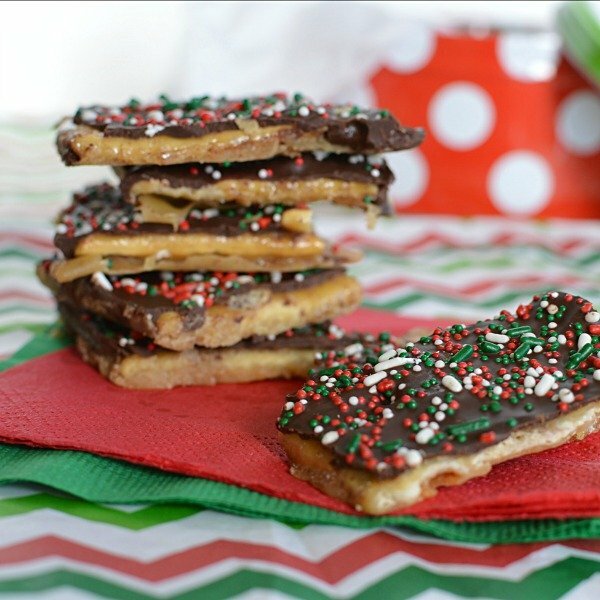 These look so amazing for a cookie exchange! It would be perfect for a cookie exchange! 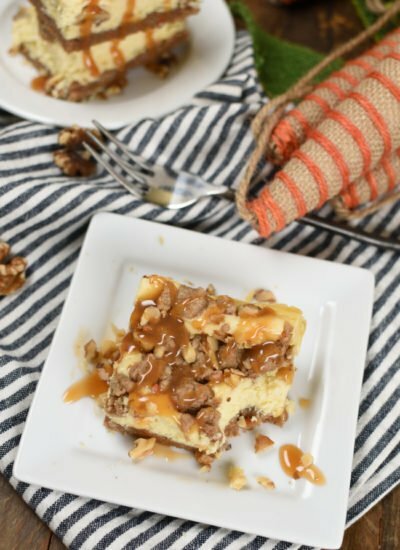 It’s one of my favorites because it’s so fast and easy, and so darn yummy! I’ve never stored these in the freezer before but they do keep for quite awhile! I would say at least a couple days! Can I put them in the refrigerator, or just in a cool place? They are delicious by the way : ) thank you for sharing! You can put them in the fridge to speed the cooling process along. Or if you have time you can put them in a cool place! Sometimes in the winter I set them on the seat in my car because it’s cold in there! It’s a perfect spot! How much sugar and butter? If you click the grey box that says click here for the recipe it should take you straight to the printable recipe! If it doesn’t work for you let me know and I’ll be sure to get it to you! Going to make this tomorrow for a Christmas cookie swap this weekend. Can’t wait to try it. Thanks for sharing your recipe. Hope mine will turn out good. Good choice! This is so easy it’s always my go to when I need a quick treat! Have fun at your swap! Hi! Am I trying to break these apart right where the cracker edges are, or just random? Yours looks so neat and tidy in the picture. I’m a little bit OCD when it comes to straight edges so I try my hardest to break them on the cracker edges. Sometimes it has a mind of it’s own and breaks wherever it wants! It’s still yummy though! Can the Crack be frozen to enjoy later? I’ve never frozen this candy before because it’s so quick and easy to make that I usually just make it when I want a batch! I’m guessing you could freeze it although it might make the chocolate on the top a little discolored. I would like to know what size pan did you use? 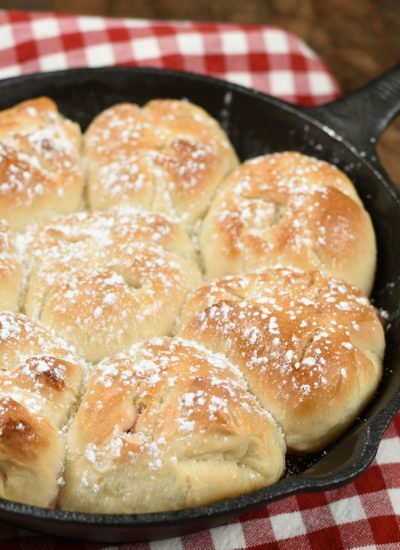 Its looks like a jelly roll pan. Hi Laura! Yes, I use a jelly roll pan! I am addicted to this stuff, I swear!! Can’t wait to make it for the holidays this year:) THANK YOU for the recipe!! Oh my goodness! We could sit there and be addicts together! I can’t be stopped either! Glad you enjoy it as much as I do! Hi there! Are you actually breaking them apart or cutting with a knife? And how long do I let them cool for? In the fridge or just leaving out? Thanks! I break mine apart with my fingers. I try to break them right along the edges of the crackers but it doesn’t always work out! They have a mind of their own and break wherever they want! It’s okay though because they still taste amazing! I usually just leave mine out until they chocolate is firm. The cooling time will depend on how cool your room is. I like to set mine in the basement where it’s cooler, or sometimes I even set them in my car where it is a lot cooler. I’ve even put them in the freezer for about 10 minutes to speed the process up! Merry Christmas! How do you get your saltines to stay in place? Mine slide all over the place when I put the toffee over them. 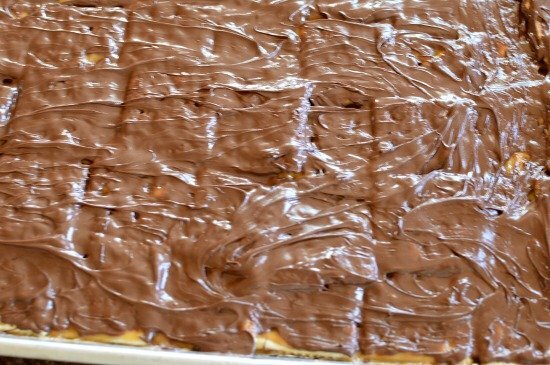 Most of the toffee ends up going under the saltines! That is always a little bit tricky! I pour slowly and it seems to help keep them in place a little better. Mine slide around a bit too and the butter/sugar mixture seep under the crackers and that’s perfectly okay! 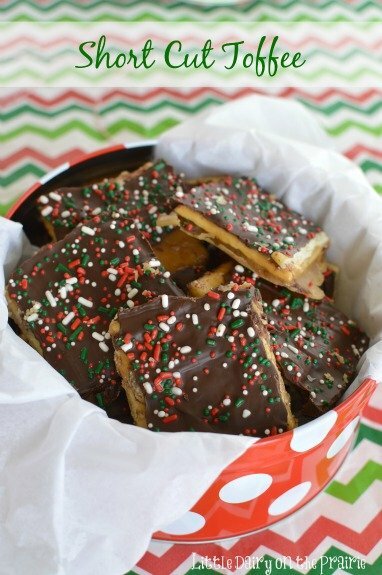 That way you end up with toffee all around the whole cracker…which is never a bad thing! I am so excited to see you answering comments! :). I made this the other day and was too excited to try them before they cooled off so, of course, right away it was all a bit mushy and sticky. I waited a few hours and it was still that way. Even the next morning it was still sticky and the crackers were not crisp the way it seems like they should be. Almost like they absorbed moisture from the butter/sugar? Has that ever happened to you? Hi Stacy! You are right, they should be crisp. That hasn’t ever happened to me before. I’m wondering if you boiled the mixture long enough and if it was a hard enough boil. You need to start timing as soon as the butter/sugar mixture is at a full rolling boil (it does’t stop boiling when you quit stirring). 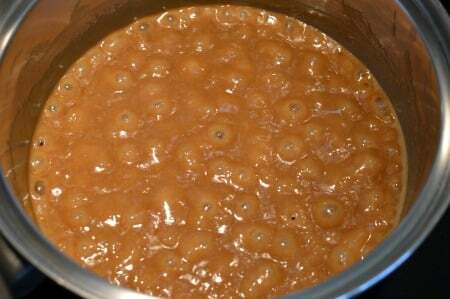 Another thing that is important is to have the oven hot and ready so you can put the crackers in right after you finish spreading caramel over them. Hopefully that helps. Let me know if there’s anything else I can help you with! I want them to turn out for you because they are so darn yummy! Ack! A FULL roiling boil!! Oh darn it! It sounds like we figured out how to solve the problem at least! I can’t wait for you to try it again! They are so yummy! Mine were mushy and sticky too! Like caramel… I put in fridge and still sticky although they taste good. I did the full boil, but it was like the butter and sugar never combined…it was an oily mess…they stayed separated. I’m on batch two now and I actually got a whisk out to make sure they combined. Fingers crossed it works this time! Hi Amy. I apparently didn’t reach the hard boil stage & now have gooey, sticky candy. Is there anything I can do to fix this batch? Hi Wanda! Oh darn it! Unfortunately there really isn’t anything you can do at this point to fix it. Now that you know your next batch will be amazing! Merry Christmas! Thank you so much for sharing your recipe. This was so much fun. My husband and I did it together and are taking it for a church party tomorrow night,-will give status report afterwards!! It’s so fun that you got to spend time in the kitchen with your hubby! I can’t wait to hear all about the feedback! 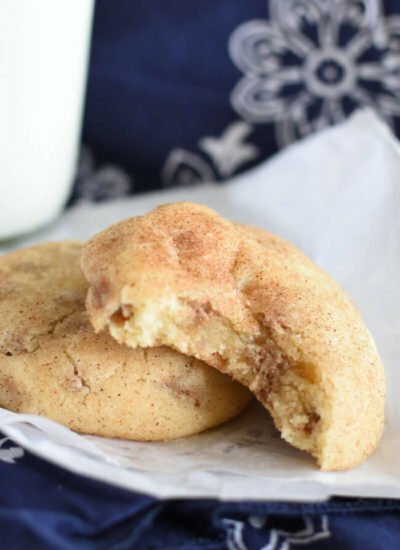 How much brown sugar and butter for one batch? There is a grey box that says something like Click Here for the Recipe! If you click it it should take you straight to the recipe. If it doesn’t work for you let me know and I’ll make sure to get it to you! I feel bad asking this as I see you are a dairy lover- but I can’t eat it- have you ever tried this with a butter substitute? Hi Kelly! Yes, I am a dairy lover! Just can’t beat the taste of real dairy. I’m always bummed for those who can’t eat it! 🙁 I haven’t ever tried it with a substitute. I’m doubt it would have that rich buttery, toffee taste if you didn’t use butter. I wish I could help you more. I’m just not experienced at using nondairy products. Best wishes! I really like the recipe and ur blog name. I did not easily navigate ads and pop ups. I know it pays u, but this is too much for a recipe! Hi Rose! Thanks for visiting my site! Sorry there were too many ads for you. I understand it can be a little buggy from time to time. However, you are right, I do make money from them and without them I would have to go get a different job. So unfortunately they have to stay! At least you didn’t have to go buy a cookbook to get the recipe though! Great recipe! It’s so easy and fast! I do wish you were a little more specific on what size pan to use and how many chocolate chips to sprinkle on top. Other than that, great! Thanks for sharing! Hi Olivia! I use a half sheet cake pan which is typically about 18″ x 13″ but can vary a little between brands. I have about 10 half sheet cake pans and they are all the slightest little bit different in size. Maybe it has to do with how steep the edges are? I’m not sure what the difference is but I know which one of my pans will perfectly fit rows of crackers! If you have a little extra room on the edges don’t worry about it. The crackers might shift a tiny bit but it will be okay! And as far as chocolate chips go, I don’t measure but II’m guessing it’s around 1 1/2 cupd! Hopefully that helps! Merry Christmas! I have made these using peanut butter chips mixed in with the chocolate chips…yummmm. That sounds delicious! Can’t resist peanut butter and chocolate! Great idea! These are so darn addicting! I really can’t be helped when I have then around! It’s pretty awesome that something so simple and easy is so delicious! Love it! Thanks for stopping by! Merry Christmas to you too! Hi, I made the 20 minute Christmas Crack tonight and followed your directions to the letter. However, the final result does not look like yours. Should the brown sugar mixture have been thick after the 3 minutes of bouling, because mine was the consistency of water when I poured it over the crackers. Hi Terri! Without seeing it’s hard to say exactly why they aren’t setting up for you. The mixture should be about the thickness of warm caramel ice cream topping after it’s finished boiling. It’s important to bring the butter/sugar to a full rolling boil before you start timing the boil for 3 minutes. 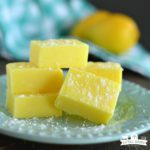 In this recipe you can’t use butter substitutes either! Hopefully that helps! The pretzel version is so yummy isn’t it! It’s equally as addicting! Thanksfor sharing! What about using Graham crackers? Graham crackers work really well. I do like the salty sweet flavor combo I get when I use saltines though! They look so yummy! How long should I let them sit before taking them apart/putting in boxes? I let them sit until they are completely cooled. You can speed that process along by placing them in the fridge, the basement, the garage (my garage is freezing), etc. Once the they are cooled and the chocolate is firm I break them apart! Merry Christmas! Oh my gosh! I really love this recipe!!! I believe the issue with the separation of the butter turning watery is possibly from using store-brand butter. I’ve absolutely had that issue using a bargain brand, but my toffee comes out perfectly every time when using higher-quality butter. That’s such a great insight! I hope nobody is using margarine either because that would not work out either! How do you break these apart so that they’re still pretty? Should you refrigerate them before you pass out as a neighborly gift? Hi Kristi! I usually store them in a cool place, not the refrigerator though. After they have completely cooled I break them apart with my fingers and try to get a good break along the edges of the crackers. You could always cut them into pieces with a kinfe to insure you get a good pretty edge though! Hi Terri! 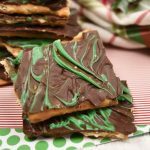 This recipe is fantastic on all different kinds of crackers, even pretzels! Let me know which version you like best! Could you use parchment paper instead of foil? Yes! That would work perfectly! Great idea! My chocolate chips didn’t melt and weren’t very spreadable. Any suggestions? Hmmm? How long did you leave them on the crackers before you tried spreading them? The heat from the baked Christmas Crack should melt the chocolate chips making them easy to spread. 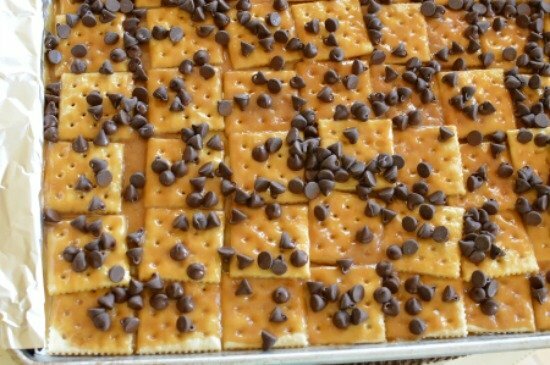 You could always melt the chocolate chips in the microwave first then spread it over the crackers! Yay! That sweet and salty combo is the BEST! Merry Christmas! This looks dangerously delicious. Plan on making today. After reading some comments I wonder should I use a candy thermometer ? And would you bring it to the hard crack temp300• or soft crack 275 degrees ? I can’t wait for you to try this! And yes dangerously delicious is the right way to describe it! I don’t ever use a candy thermometer and don’t have a problem getting them to set up at all. I think the trick is making sure you bring the butter/sugar to a slow boil (over medium heat) stirring constantly. Bring the mixture to a full rolling boil before you start timing. As soon as it comes to a rolling boil (a boil that doesn’t stop boiling even when you are stirring) remove the spoon or whisk and start timing. It should turn out perfectly if you just make sure it’s really at a full rolling boil! Let me know if that answered your question! Merry Christmas! 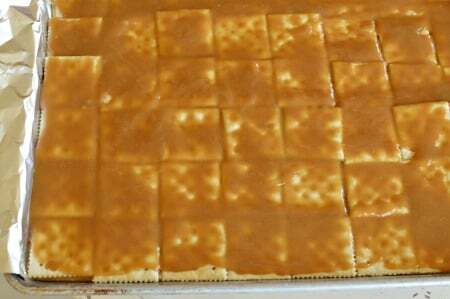 I use a half sheet baking pan and add as many crackers as will fit, usually a little shy of 2 sleeves. I use the entire amount of caramel mixture and chocolate chips over that half sheet baking pan! Hopefully that helps! Merry Christmas! Do you use dark brown sugar or light brown sugar? Thanks! Hi Allison! I use light brown sugar! Merry Christmas! 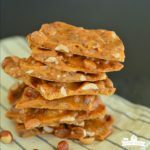 This reminded me of one of my favorite cookie recipes, using graham crackers instead of saltines, and adding nuts to the butter/sugar mixture, along of some of my favorite wintery spices. Thanks for sharing! The walnut version sounds delcious! Thanks for stopping by! What size cookie sheet is recommended? I have made this before but am traveling & only have a 15.25×10.25x.75. Should that be alright ? I use a half sheet cake pan, 12×16. The size you have should work just fine! It doesn’t have to be exact for this recipe to turn out! Looks like this could be something I could make; but this recipe goes on n on – can we cut it down. My MacBook says it’s 7 pages to print this thing off. what? There should be a print button on the recipe card at the bottom of the post. If you click on that it should take you to a screen that will just print the recipe and not the rest of the post. Hope that helps! THis is soooo good I can’t keep it on hand or I’ll eat it all! You will not regret making it. You and me both! I can’t ever stay out of it when I have a batch made! It’s the death of me! Hi Terry! I don’t measure the temperature. 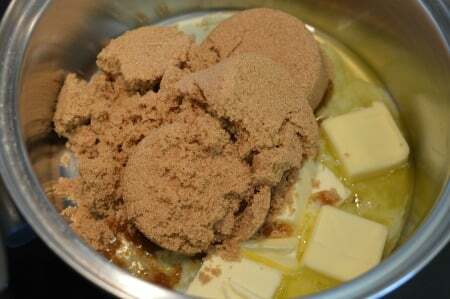 Slowly bring the butter/sugar mixture to a gently, but full boil that doesn’t stop when you’re stirring it. At that poing remove your spoon and stop stirring. Make sure the boil is gentle so the sugar mixture doesn’t burn. Boil it exactly for 3 minutes. It always turns out perfectly for me using this method. Good luck and let me know if you have any more questions! Can you recommend something else to use as the base other than saltines? Saltines are my very favorite because I absolutely love the salty sweet combination. Graham crackers, pretzels, or Ritz crackers all work wonderfully too. I think you’re going to love these! One way to know if your chocolate chips are melted enough and ready to spread is they will have a shiny appearance. I also turned the oven off and put them back in until they became shiny, which was 1-2 minutes at the most. That’s a good point! I put my candy back in the oven, with it turned off, for a minute to finish warming the chocolate chips up too. It works great! Thanks for the tip! the kids said, “ It’s gooder!” This does not last long because it is so good! Thank you for this recipe! Kids are so cute! I love that it turned out gooder! They might be hyper for awhile, but at least they enjoyed it! YES! You need to try this as soon as possible! It’s the best dessert ever! You’re going to fall in love with it! This year I’m for sure makings these. I CAN’T wait for you to make it! This is the most addicting food in the whole world! Enjoy! This is my favorite dessert to make on Christmas. Oh my goodness! Me too! The only problem with this candy is that I can’t ever stop eating it! It’s way to yummy! Enjoy! How much of each ingredient do you use? Or do you just eyeball it? Hi Joelle! So often I eyeball ingredients, but NOT the butter and sugar in this recipe. 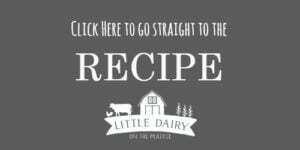 Click on the gray box that says something like, “Click here to go to the recipe” and it will take you to a complete recipe! If it doesn’t work for you let me know and I’ll be sure to get it to you!